I’m a Tobacco Treatment Specialist (stop smoking coach and counselor) in private practice for 14 years. I’ve worked with thousands of private clients and conducted over 100 public seminars. I was a heavy smoker myself for 30 years, now I’m an educator, counselor and researcher. Here on this blog I try to answer as many questions as I can about smoking, vaping, tobacco, nicotine and TCH use. I’m also a Registered Psychotherapist — I use cognitive behavioral techniques, positive psychology interventions, neurolinguistics, mindfulness training, guided imagery and even hypnosis in my practice — so my answers often include references to attitude, perception, subjective well-being and the language of self-directed behavior change. I hope you find the information here helpful if you are trying to stop smoking, or useful if you also work with tobacco users , or just interesting if you are … just interested. Cognitive Dissonance refers to the internal, mental conflict that inevitably arises whenever your own beliefs and your own behaviors are in conflict with each other. When you are unwilling to do what you know to be right, or you intentionally do what you know to be wrong, you experience this inner conflict to some degree. One consequence of intense cognitive dissonance is a steady erosion of self-esteem. Self-esteem can be influenced somewhat by external sources (positive or negative things other people say about you, for instance) but it’s primarily derived from internal consistency — from you yourself being able to do what you believe in, and being able to believe in what you’re doing. The consistency itself is what matters most, much more than any details of the specific beliefs or behaviors. If you happen to be carrying around a discrepancy or disconnect between your own beliefs and your own behaviors, you’ll feel that steady erosion of self-esteem every time the subject comes up. And we don’t like that feeling. Self-esteem is so important to humans that our need to preserve it creates an instinctive psychological drive to change. Dissonance creates a desperate desire to change something so we can achieve consistency and eliminate the problem. But what can we change? The beliefs? The behaviors? It depends on the topic. Addiction is the classic model. Let’s use cigarette smoking in particular. We all have the same belief about smoking, all of us including smokers are fully aware that it’s a bad idea. But many people do it anyway. If you know it’s a bad idea, but you’re doing it anyway, you experience cognitive dissonance. In this example, smokers don’t have the option of changing the beliefs. Because you can’t honestly convince yourself that smoking is a good idea. You certainly canchange the behavior, but smokers tend to put that off as long as possible. “— but I’m really stressed. “— but I heard it’s not really that dangerous. That great big “BUT” is the trademark of Cognitive Dissonance. If you hear yourself making these kinds of statements — deep down, you already know what’s wrong. Step #1 – Figure out if it’s the belief or the behavior that is wrong. Okay that step may not always be automatically easy. Maybe some kind of coaching or therapy can help to figure out what those actual core beliefs are and whether they are rational or not. Step #2 – Change the one that’s wrong. Step #3 – Experience internal consistency and improved self-esteem. This is not a new idea. 2000 years ago, Greek philosophers defined the classical ideal of “Virtue” as the intrinsically rewarding internal state we experience when we take responsibility and control over the only two things we can control in life — our own actions and our own opinions. But here’s my modern version, a handy reference chart. If you know a thing is wrong, but you do it — you feel wrong. If you know a thing is wrong, so you don’t do it — you feel right. If you know a thing is right, but you don’t do it — you feel wrong. If you know a thing is right, so you do it — you feel right. 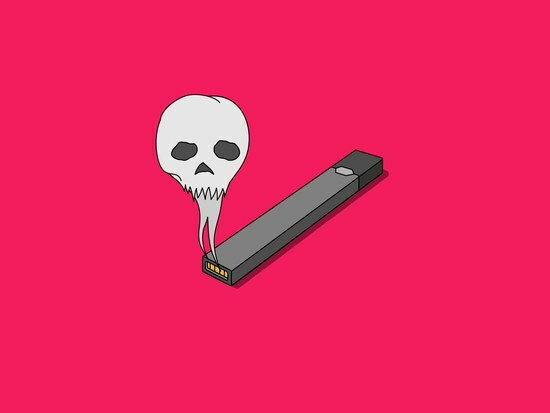 Q: How often can I have one puff of an e-cig or Juul without causing harm to my brain? Causing harm to your brain is not really the issue with recreational nicotine use. And the physical effects of nicotine tolerance / withdrawal are largely overstated (to sell nicotine replacements like gum, patches and vaping). However — the more you self-administer a rapid-onset, short-duration psychoactive drug effect to your brain, the more frequently and insistently your brain will say “Do it again!” Repeated recreational-dose level nicotine use is predictably reinforcing of behavioral triggers, and that is the real driving principle of nicotine addiction. I’m assuming from your question that you are not a current tobacco user and therefore most likely a teen or young adult. For teens, the inherent risk of e-cig use is a stronger likelihood of become a smoker than for teens who do not use e-cigs. Some studies show over 30% of teen e-cig/vape users (who were not previously smokers) became tobacco smokers within 6 months of initiating e-cig use. As I now see a gang of adult pro-vapers about to start throwing tomatoes and eggplants at me — yes, these food do contain trace amounts of nicotine, but let’s be really clear about this : You would have to instantaneously consume over 20 pounds of eggplant to equal the 1 mg of nicotine typically experienced from vaping or smoking a cigarette. Even if you could do that (and it has to be all at once), it would still have to slowly pass through the digestive system and would not produce the habit-forming behavioral reinforcement created when you instantaneously self-administer a rapid-onset, short-duration psychoactive drug effect. That’s the thing you want to avoid. Q: How can I stop smoking forever? Step #2: Become and Remain a Nonsmoker by Choice. Smokers who are “Trying To Quit” spend their time and energy trying to “fight the addiction” — they worry about nicotine dependence, habitual behaviors, lies and excuses. Naturally, that all feels like punishing hard work. Technically, yes, smoking functions as a type of addiction in all three of these ways — but there is nothing about that fact which prevents people from stopping easily, immediately and permanently. I’ve seen heavy smokers — multiple packs per day — who, one day, just stop. Cold turkey. They don’t struggle, crave or relapse. They say it was easy. Meanwhile, other smokers — even light smokers — complain that quitting is too hard and they are not able to do it, that the “addiction” is so severe, worse than heroin even! These are famous excuses that serve one purpose only — they defend and rationalize continued smoking for the person who accepts them. They don’t stop completely. They try to cut down or replace the nicotine with NRT or vape. If they do stop for a while, they celebrate by having some nicotine later on, and they fall right back to their prior habit. They stop completely, cold turkey. No nicotine at all ever again for life. To a smoker, that sounds like it would be the hardest way to go, but in fact it’s the thing that makes it easy and it’s only thing that works. Anybody who ever quit successfully eventually stopped completely. The difference is all about perspective — and you have complete control over that (though most people don’t realize it). Language creates perspective is reality. Want to change reality? Change your perspective. When you know that the experience of being a nonsmoker is the one you prefer, the one you selected by adult, informed, personal choice — by preference —that’s when it becomes simple to sustain every day for the rest of your life. Because we never struggle when we’re getting what we really want. I say it’s up to you. Whether you believe that the simple act of not smoking is a wonderful freedom to be enjoyed for life, or a horrible punishment to be avoided at all costs, you are guaranteed to experience the result of your own opinion. All you have to change is your mind. © 2019 Tobacco Tools. All Rights Reserved.